Midas Touch Review - Scam App! 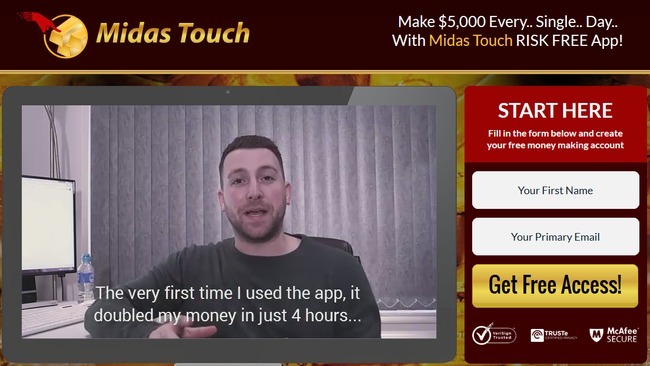 Midas Touch Review – Scam App! Midas Touch found at midas-touch.co is hailed as a miracle app that makes guaranteed profits through gold trading. However, don’t deposit any money into your account, because Midas Touch is a scam. Read our in-depth Midas Touch review to keep yourself from getting into a financial headache. The homepage of Midas Touch scam doesn’t have much distractions. There’s a highly exaggerated and fake headline – making $5,000 every single day with Midas Touch RISK FREE app! But the real question is – is the app really risk free? Will it really make $5,000 for its users every single day? Of course not, the headline is just there to attract your attention and to make you watch the sales video. Once you focus on the video, you’ll see the testimonials of a few members who give praise to Mark Williams and his Midas Touch app for changing their financial life. However, don’t buy into their testimonials because they are all actors. We’ll provide definite evidence to prove that these are all fake testimonials. 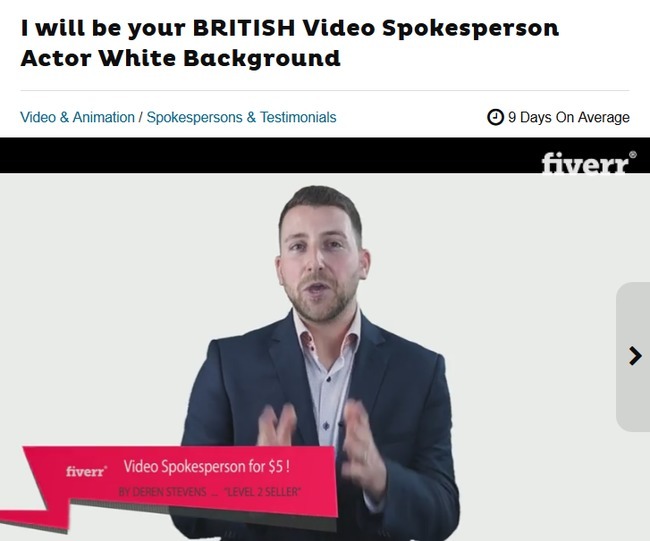 Compare this Fiverr actor to the man featured in Midas Touch sales video (see first image in this article). They are the same person, and this actor was paid by the scammers behind Midas Touch to give a fake testimonial for their sales video. 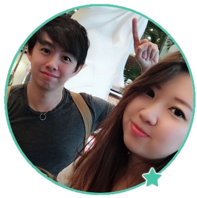 He has also been featured in multiple other internet scams, some of which we have reviewed before such as Alpha Money Generator and Certified Income scams. 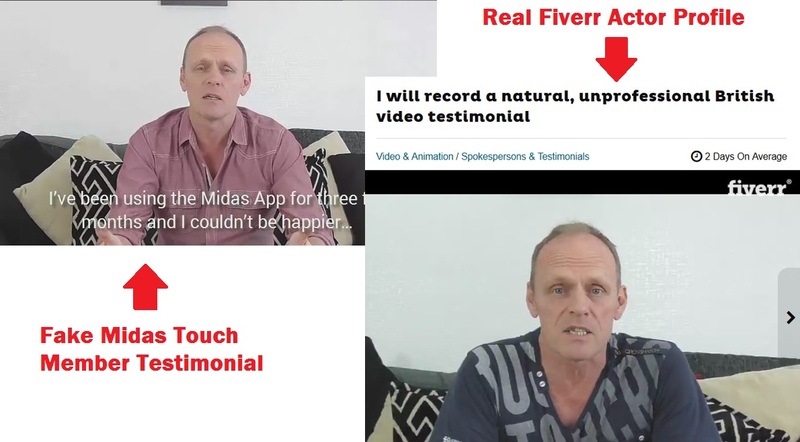 At this point, we understand if there are some skeptical readers who think it’s just a coincidence that this particular Fiverr actor is making money from Midas Touch app. There is still a chance that the app actually works, right? If you still had high hopes for Midas Touch scam, a second Fiverr actor should be enough to cast any doubts away. These Fiverr actors are paid to read the scripts given by their clients (in this case the scammers behind Midas Touch) like real testimonials. 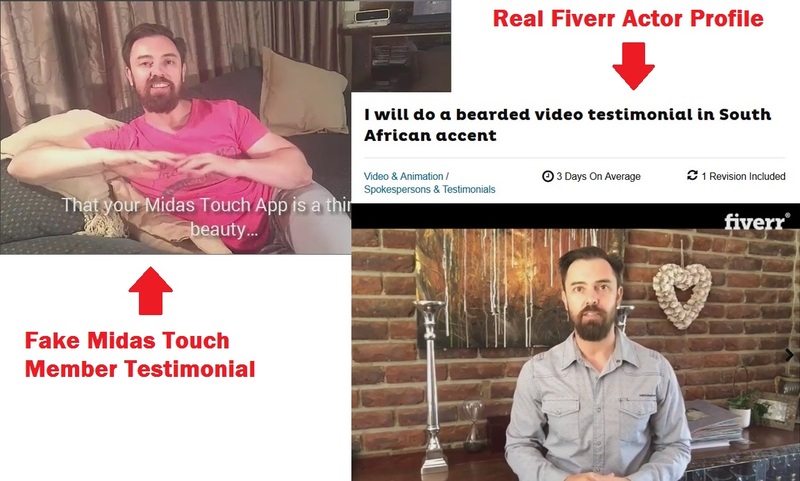 Generally, a fake testimonial can be bought from Fiverr.com for as low as $5. Just to satisfy the more skeptical readers, I’ve decided to expose one more fake member for good measure. We do not condone or condemn the act of buying and selling fake testimonials, but we want you to be aware of this – that fake testimonials can easily be bought online. The next time you come across an opportunity that seems too good to be true, do some research and stay alert. It is most likely a scam. Even though Midas Touch touts itself as a RISK FREE (remember the headline above the sales video?) and guaranteed to make money trading, Mark Williams and the scammers behind the scam have something to hide within their risk disclaimer. You won’t find this document within the sales material, because it is supposed to be hidden from you. The only place you can find it is through a fine print at the bottom of the sales page that reads “risk disclaimer”. The Midas Touch promotional video is fictitious and was produced to portray the potential of Midas Touch 3rd party signals software. Actors have been used to present this opportunity and it should be viewed for entertainment purposes. Binary options trading entails significant risks and there is chance that clients could lose their investments. Do not invest money you cannot afford to lose. You are responsible for any decision made by you based on information on this site. Midas Touch scam chooses to disclose the fact that the sales video is fake in their hidden risk disclaimer. What does that tell us? The scammers are clearly trying to hide this fact from its potential victims! The scammers admit that they’ve used actors to present the “opportunity” (read: SCAM). And apparently we should view their lies for entertainment purposes only. Contrary to what Midas Touch claim, there’s no guaranteed winning with the app. Midas Touch scam admits that binary options trading comes with significant risk, and their users are most likely to lose all their investments. If you use the app and lose all your money, it’s your own responsibility. You cannot hold the scammers behind Midas Touch accountable for your own decision. This disclaimer is not here to give you a fair warning as a consumer. The sole purpose of this disclaimer is to protect the scammers behind Midas Touch scam. You can’t take any legal actions against the scammers when you lose all your money with the software. It’s been detailed in the disclaimer that you are responsible for your own decision. If they wanted to be honest about the risks of using the software, and the fact that actors were used to present fake testimonials, they would’ve told you in the sales material. Instead, they chose to present you with lies and fake promises. Is Midas Touch a Scam? YES, MIDAS TOUCH IS A SCAM. We strongly advise you to stay away from the scam if you don’t want to lose your hard-earned money. Trade Tracker Pro Review – It’s a Scam!